Generations at Oakton has a special Alzheimer’s and Dementia Care Unit that is designed to meet our resident’s needs in a supportive environment. 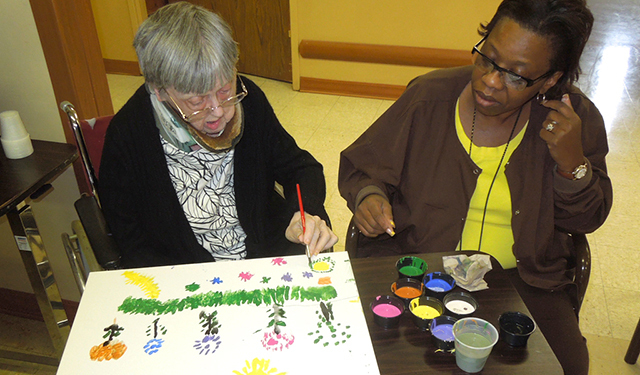 Our care program treats the unique needs of individuals with Alzheimer’s Disease and Dementia or other related memory impairments. Our focus is to recognize each person’s physical, mental, and social capacities and/or limitations. We provide an environment where individuals can maintain an optimal level of independence and quality of life in a secured and safe environment. Why Choose Generations at Oakton for Memory Care? Generations at Oakton staff has specialized training in caring for those with Alzheimer’s, dementia and related diseases. Our expertise and care management can make a significant difference for individuals and equip the caregiver with the physical and psychological resources they need. Our facility has 24-hour support and programs that ensure safety and quality of life. Our residents receive the specific care they need by a staff that is specially trained in caring for individuals with dementia. Generations at Oakton offers 24-hour nursing assistance in a secured neighborhood with an appropriate alarm system to monitor persons requiring more assistance.